I heard a poignant review about this movie on NPR, and simply decided to go see it the next day. The timing of the release of this movie is quite fortuitous, with the disastrous wildfire season this summer and fall on the West Coast. 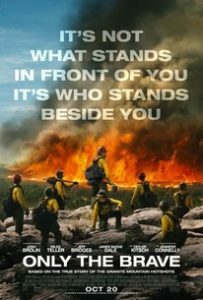 Only the Brave is based upon the true story of the Granite Mountain Hotshots, many of whom lost their lives fighting a fire outside Prescott, Arizona in 2013. Directed by Joseph Kosinski and starring Josh Brolin and others, the story is told without over-dramatization. It is, to quote various reviewers, "deeply emotional," "satisfying" and "devastating." This is one of those movies where the credits start rolling and no one moves from their seats. I am quite thankful I saw it. It feels important in this day and time when so many men and women put their lives on the line to fight wildfires. It honors wildfire fighters. I also had a lighter personal interest in choosing to see it. Prescott was our runner-up when Beryl and I chose to return to Bend, and I was hoping for some fine shots of Prescott and the surrounding wildernesses. I was not disappointed. This weekend, grab a bag of popcorn and make a journey to your local theater. Oh yes, you will need a tissue also. I think Greg and I are going to this movie on Monday. He read the book and as you can imagine is something that hit him hard. Thank you for your review. Let us know what you think, please! My hotshot is eager to see this. Ned participated in many forest fire fighting efforts during his 30 years with the USFS. You too .. let us know what you think please! Ned and I saw yesterday and both give it two thumbs up. Ned thought it portrayed forest fire fighting pretty accurately, based on his 30 years with USFS and much fire fighting experience across the country. It is exciting. It is scary. Some fun stories to tell. Some haunting memories. As we were heading in to the show, ran into one of his former colleagues and his wife coming out of the first showing. Mike headed up the ‘fire shop’ for the Hiawatha Nat’l. Forest. He was responsible for organizing and coordinating fire crews for local fires as well as with fires across the country. He also felt the movie was very well done. I was impressed by the courage and camaraderie of these guys. And the stress this type of work makes on relationships. Early in the movie, the crew does a training run up in the hills. The sup turns to them and tells them after their first fire, they will never look at this view in the same way. They won’t see trees, woods, etc. They will see fuel. Before he has finished that statement, I knew that’s what he would say because that is how Ned views woodlands. This was one of the first things he commented on after the movie. The experience truly does alter perspective. Wow. I am really moved by your posting. Ned’s views brings tears to my eyes. I vole this man, and I somehow haven’t even met him yet.